This week has been such a blur. I've been getting in some good running/training, but really, besides the start of school, I can only remember this week by the numerous times I went out to eat. I'm not used to eating out that much, as I never did often as a child. I remember in high school, going to an end-of-the-year banquet not knowing how to use my napkin and cutlery at my table. I much prefer cooking and dining in with "The Ukrainian" than going out, but that is what the schedule had brought us this week. But with the Surf City Half-Marathon coming up next week, I need to make sure I keep my eating much, much healthier than it has been this week! At least I can now bring you some pictures, which is good, since I think more people have been coming to my blog to see them! Above: Before my Wednesday night salsa lesson, "The Ukrainian" and I want to New Happy Family Vegetarian Restaurant in Rosemead, CA. This place serves fancy seafood Asian dishes minus the seafood. 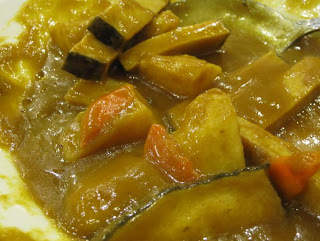 This picture above is fish curry. It was not bad, though I could have had the curry thicker. What can you expect without butter? 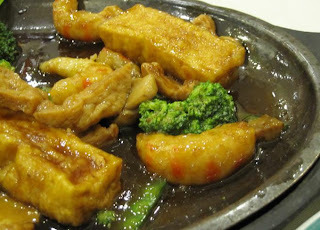 Above: A skillet. Note the fake shrimp. I apologize for forgetting to shoot a pic until we were halfway done with the meal. 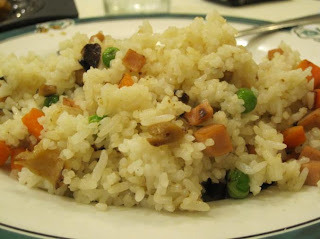 Above: This came free with the meal -- fried rice. 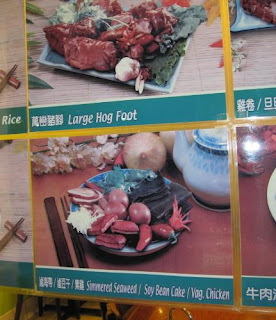 Yes, that's fake ham. It was tasty. Again, we ordered too much food, so this became another meal. Above: My co-workers and I stopped at Waba Grill in Chino, CA during our software training. 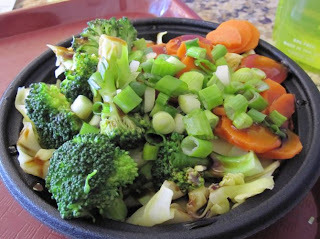 This is a veggie bowl with brown rice (sorry the rice is not pictured). They claim to be healthy, and I could definitely taste that -- in the best way possible. 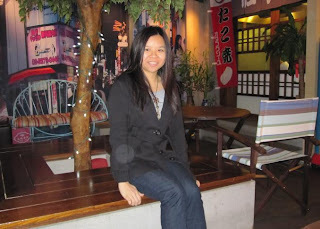 Above: No, I didn't go to Japan... this is actually Genki Living, a crepe place in Arcadia, CA. 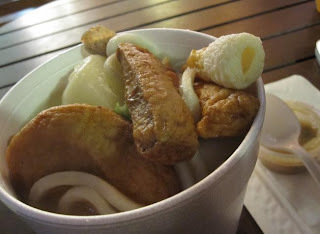 Above: I got this oden bowl, which came with fish cakes (not eaten by me), fried tofu, a boiled egg, udon, and daikon. Above: And here are the crepes -- kiwi/red bean/custard, cheesecake with nutella and peach, and a taro taiyaki that I brought home to my sister. Above: One of my lunches this weekend was with two of my closest friends, who I will refer to as "Choir Girl" and "Councilman." We went to Hot Stuff Cafe in San Gabriel, CA as part of dineLA Restaurant Week. They had special three-course meals for a discounted price, although I ended up ordering off the regular menu due to lack of vegetarian options. 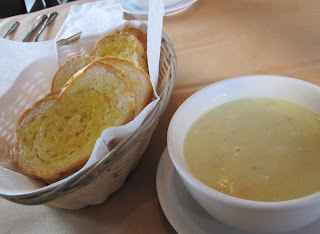 Here is the starter garlic bread (nothing special) and cream of corn soup. Above: The appetizers -- duck pate with crutons, scallop sashimi with fennel and ham. 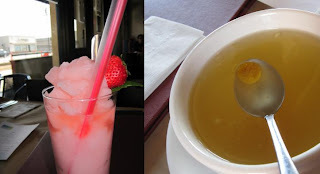 Above: The drinks we got -- strawberry/lemon/plum slush and kumquat/honey/lemon tea. Somehow, the entree pics (pecan-crusted salmon and my sweet potato ravioli) never turned out, so you'll have to settle for these! 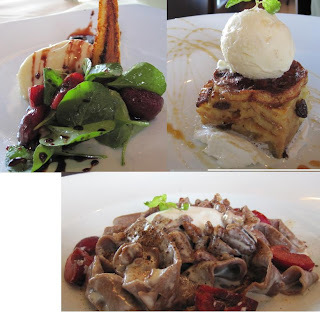 Above: These were our desserts (from upper left, clockwise -- whipped brie, bread pudding, and chocolate pasta). The pasta was a big fail and was left rather untouched. The brie was good, but the bread pudding turned out to be my favorite.